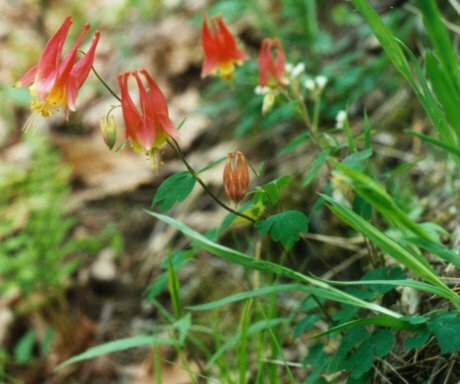 A Columbine. Credit: Craig Holdrege. All rights reserved. When a Columbine grows up out of the crack in a rocky outcrop, it is doing something remarkable. It is forming new living substance out of the interplay of light, minerals, air and water. Its roots explore the fine soil hidden in the rock fissures, while leaf after leaf unfolds in the air and the light. Then the buds burst open with red and yellow flowers that dangle in the wind and attract bees and other insects. The Columbine lives in transformation, an interweaving of its life with the conditions of the environment that surrounds it. The study of nature thus becomes a process of self-transformation, and by learning from genuine presences such as plants (or others that emerge from your own experience) we can begin to internalize the qualities of dynamism, interconnectedness and wholeness that plants so clearly embody. This is what I mean by “thinking like a plant.” In this process, we learn to become more context-sensitive in our interactions with the world. This helps us to shed the isolating armor of blatant ignorance - the ability to ignore vital connections that is such a widespread and destructive force in our culture. Take the example of genetically modified (GM) crops. GM crops are resistant to the herbicide glyphosate, and they have been grown on millions of hectares of farmland in the USA since 1996. These crops (mainly commodities like soybeans, cotton and corn) can be sprayed with the herbicide and survive, while weeds in the fields around them will die. This makes weed management much simpler on huge farms, and over the last twenty years most of these commodity crops in the USA have become genetically modified. Any plant ecologist knows that weeds will become resistant to herbicide if farmers plant only herbicide-resistant crops, discontinue crop rotation practices, and spray mainly glyphosate. And this is what has happened. Amory Lovins wisely remarked that “if we don’t understand how things are connected, quite often the cause of problems is solutions.” In the case of weed resistance we do have some idea of how things are connected, and what agribusiness and many farmers have done is to blatantly ignore this knowledge. Monsanto and other companies have earned billions of dollars from GM crops during the past eighteen years - a “successful” strategy that makes profits on the basis of short-term efficacy. Perhaps they hope that they can develop new herbicides and herbicide-resistant GM crops to provide the next “solution” to the problems they’ve already created, and keep the earnings flowing. It’s not hard to understand that actions of this kind, which are based on blatant ignorance, rip through the interwoven fabric of life and become destructive. Our culture, wittingly and unwittingly, reinforces this ignorance by emphasizing and rewarding short-term results, be they quarterly profits, a blockbuster movie, or success on standardized tests that are used in schools. It’s as if we are continually saying: don’t worry about the bigger picture, get what you can now and get as much of it as possible - let others worry about the consequences. But there’s another, fruitful type of ignorance. It’s the ignorance that grows as you learn how things are connected, and in the process realize that you have hardly begun to fathom the rich and intricately-woven fabric of the world. I’ll call this “learned ignorance,” borrowing the phrase from the renaissance philosopher, Nicholas of Cusa. Learned ignorance not only gives you - paradoxically perhaps - a sense of belonging to the world, but also a circumspect attitude in relation to human action: how can I act in ways that allow my behavior to contribute to the evolving fabric of life, rather than to its dissolution? These presences consist of things in nature and human culture that show us connectedness and interrelatedness. They could be a flowing creek, a rock outcrop, a plant growing up through a crack in the sidewalk, or the culture we embody in preparing, serving, and conversing at a meal. When we pay attention to their qualities, our active acknowledgement of, and participation in, such presences can help us to become more truly rooted in the world.